BANGI, 14 October 2014 – Libraries and resource-centres should be more user-friendly so as to tap the more than 13 million social media users in the country. 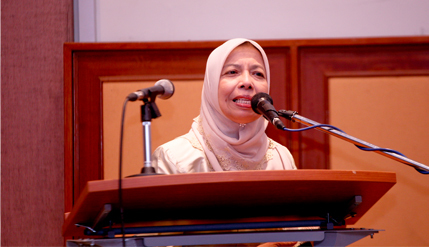 Director of The National University of Malaysia’s (UKM) Institute of Visual Informatics Prof Dato’ Dr Halimah Badioze Zaman said libraries and resource centres should attract customers to become a vibrant community using all available multimedia technology including cloud computing. Giving her keynote address at the three-day VTLS User Seminar here today, Prof Halimah regretted that even well-established libraries now find it hard to attract young people who grew up in the digital age. Prof Halimah, who is head of the Information and Communication Technology (ICT) cluster at UKM urged libraries to attract the growing social media market, especially among the young who have less interest in reading from hard-copy books. She expressed concern that libraries would become a deserted storage place where only books are kept. According to records, references queries to libraries have gone down. She warned that Malaysia faces great challenges and it have to move along the lines of developed nations. “At the end of the day, it is people like me that should be served. We should seriously consider whether we should integrate technologies,” she said. As an archive she envisioned a library as a ‘place of memories’ where people can find out about the past while exploring new ideas which are digitally accessible. She urged librarians and curators to have their material accessible to mobile devices and be able to tell stories while facilitating learning. The user seminar is the seventh in the series sponsored by VTLS Technologies Sdn Bhd, a global company with a branch in Petaling Jaya which provides archiving and cataloging solutions to various local libraries, including the Tun Seri Lanang Library (PTSL) at UKM. The Tun Seri Lanang library has been using VTLS services for over 30 years and helped UKM to go fully digital in 1999. Present were Deputy Chief Librarian of PTSL Rosnah Suliman, VTLS Technologies Sdn Bhd managing director Gina Phan and Vice President of Innovative Interfaces Dr Vinod Chachra. During the seminar, UKM and VTLS also launched the “Big Brother” programme in which PTSL would become a mentor to smaller libraries, especially from among the newer public universities. This year’s event introduced a Chief Librarian’s Session with various informative activities and knowledge enhancement sessions such as Technology Update, Learner Track, Customer Show-And-Tell and Software Highlights.